03.10.07 Scholastic chess players from across the state descended on the University of Maine, Orono to compete in the Maine State Scholastic Team Championships on Saturday, March 10, 2007. Awards were given in numerous sections including: High School Championship, High School Reserve and Novice, Junior High School Championship and Novice, K-6 Championship and Novice and K-3 Championship. A gigantic illustrated report is on the way but in the meantime, here's the Flash Report. 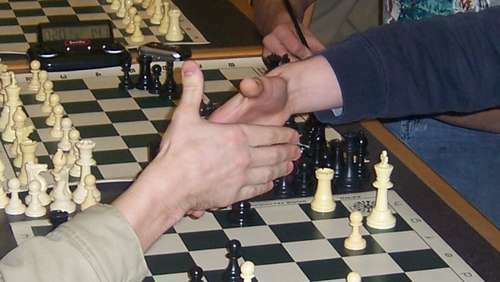 This is the handshake between Bryant Ciomei (left) of Deer Isle - Stonington High School and Fritz Eyerer of John Bapst Memorial High School that gave Eyerer the point and clinched the state high school title for John Bapst.